The third full week of May is National Dog Bite Prevention Week. According to the CDC (Center of Disease Control and Prevention), each year 4.7 million people are bitten by dogs. Of those, 800,000 receive medical attention and approximately 16 result in fatalities. Although only .01 percent of dog bites end in death, the AHRQ (Agency for Healthcare Research and Quality) states that infection is the number one reason for hospitalization. “Once bitten by a dog, it is important to seek medical attention. It doesn’t necessarily have to be that second, minute or even within an hour, but waiting a couple of days is a bad idea,” says Dorian Drigalla, MD, FACEP, director, Scott & White Emergency Medicine Residency Program. In 2011, Scott & White Emergency Department treated 149 people with dog bites. “The most common type of dog bites we see are facial and hand bites in children, and hand and lower extremity bites in adults,” says Dr. Drigalla. Try to calm and comfort the person. Wear gloves (if possible) and wash your hands thoroughly before and after attending to the wound. If the bite is not severely bleeding, thoroughly wash the wound with mild soap and running water for three to five minutes. Then, apply antibiotic ointment and a clean dressing to the bite. If the bite is actively bleeding, apply pressure directly to the wound with a clean, dry cloth until the bleeding stops. Raise the area of the bite above the heart. If bitten on the hand or fingers, seek medical attention immediately. Watch the bite area over the next 24 to 48 hours for signs of infection such as increasing skin redness, warmth, swelling, and pain. Call the doctor or take the person to an emergency room if the bite becomes infected. Even your dog may have bacteria present in its’ mouth, with the potential to cause infection. For that reason, many physicians will place patients on antibiotics to prevent infection. The location of the bite, such as the hand or face, will also determine the use of antibiotics. “The hand has small compartments that tend to get infected,” says Dr. Drigalla. If it is your personal dog, some physicians may choose not to administer antibiotics, although they will recommend that you return in a few days for a follow-up to check for infection. If no infection is present, then no antibiotics are necessary. 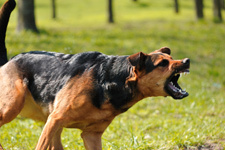 A bite from an unknown dog is more alarming, especially if the animal behaves irrationally or bites without being provoked. That type of attack would be considered concerning and it is recommended that you see a doctor immediately. It is good to remember that not all dogs that bite unprovoked will have rabies. “While we do know that rabies has happened and there are reported cases, we don’t often see humans actively infected with rabies, mostly because they come in, get evaluated and treated,” says Dr. Drigalla. Previous Previous post: Understanding Radiology: What is a Radiologist?